It was 50 years ago today that this photo was taken. I’m the tall guy in the back row, second from left. It was one day during this class I came to consciousness with a crayon in my hand. The reason that I bring this up is that recently my niece Rachel, for a high school art project, had to interview an artist. The following are the questions she asked and my answers. This project was interesting for me because, although you may know me, you may never have asked me these questions. These are not the type of questions that you normally discuss on a résumé or in casual conversation. So here goes…. Q.Who and/or what inspired you to become an artist? A. My desire to become an artist came from the inside not the outside. It was a gift from the creator that I was born with. Q. Can you remember one of the first things you drew/sculpted/painted/photographed etc.? What makes it memorable? A. I was drawing before I can really remember. I came to consciousness with a crayon in my hand. The first portrait that I remember painting was of your Father when I was 13 years old and he was 8 years old. Q. When did you decide that you wanted make art your career, and how did you accomplish that goal? A. I decided to pursue art as a career in high school. I spent many days after school drawing and painting in preparation for college. I wanted to be ready. The hard work paid off as I became valedictorian of my college class. Q. Why is oil paint your preferred method? How do you use knives in your work? A. I find oil paint to be the most lasting and flexible medium to paint with. I can make it do what I want, from thin washes to thick impasto. Palette knives are fun to work with and I use them to achieve textures that are not possible with brushes alone. Q. What medium would you love to peruse, but haven’t yet (or don’t often)? A. I am always open to new challenges and inspiration whatever medium that leads to. It depends on the inspiration and subject matter. Glass blowing, metal and stone sculpture are 3 mediums that I have not tried…yet. Q. What is your most important artist tool? Is there something you can’t live without in your studio? A. My brain is my most important tool. It is where ideas originate. I exercise, eat healthy and learn something new every day to stay sharp. What I can’t live without in my studio is good natural light for when I can’t paint “en plein air”. Q. Is there an artwork you are most proud of? Why or why not? A. I am very proud of the two portraits that I painted last year. One of my wife, Nancy and one of my Mother, Jane, the two women that I love most in the world. Q.How do you know when a work is finished? A. Sometimes it is difficult to know. Usually when I don’t see anything that I think needs to change to make the work better, I stop. Afterward sometimes I see things that I would change, but you can’t go back or you run the risk of ruining the work. Q.Do you have a favorite artist? If yes, what draws you to that person’s work? If no, from whom, if anyone, do you get your inspiration? A. I just happen to share a name with my favorite artist; Vincent Van Gogh. His vision showed the world a different way of seeing. Q.How has your style changed throughout your career, if at all? “An artist is always in the act of becoming” is a quote that I have heard and speaks my mind on this question.My style is always evolving as I change, react, and see the world differently and as my skills increase. 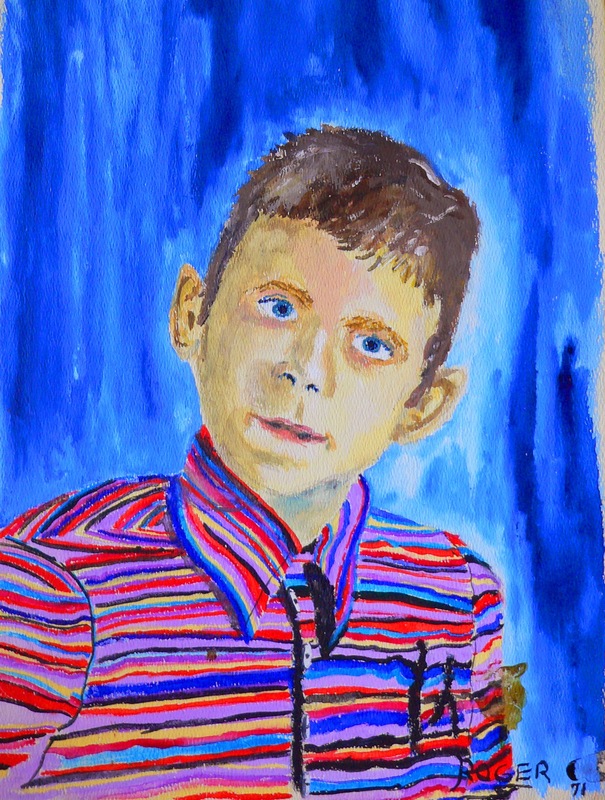 Here is the watercolor portrait that I painted of my younger brother Ray in 1971 at the tender age of 8. I was 13 at the time. So interesting, Roger. Thank you for giving us a glimpse of the inner workings of your art and inspiration. I just love the portrait of your brother, Ray. The primary colors, that do remind me of certain favorite crayons, just leap out and say keep an eye on this guy. He is going to make great art… PS How did you get an 8 year old to sit still? 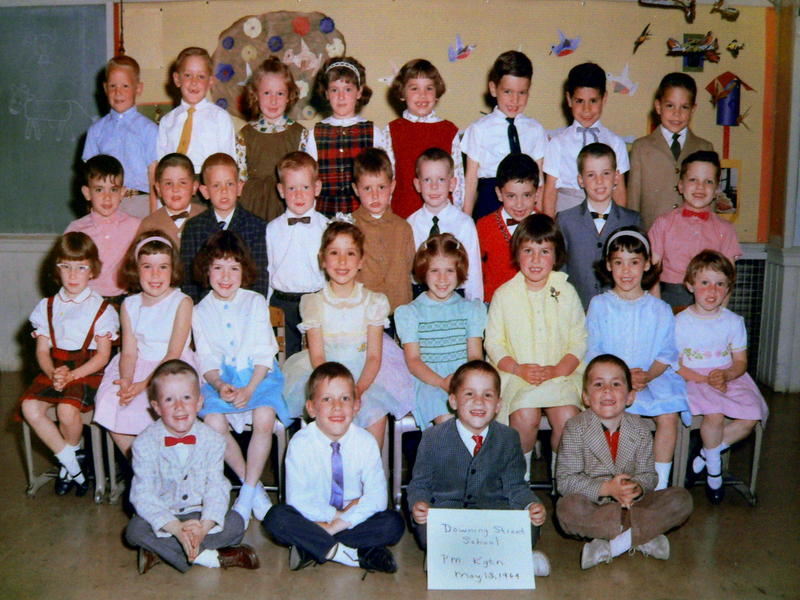 I left a comment on the blog, Rog, but I forgot to say that your kindergarten picture is adorable! Isn’t it strange that I just came across that photo after all these years when I was looking for Ray’s portrait? 50 years to the day! We just found the the perfect opening sentence to your biography by Nancy Jane Lang: “I came to consciousness with a crayon in my hand”. Could be a great title too. How could it be possible that I have known you going on twenty years my friend and you never shared your brothers middle name with me? Yes, I know, I never asked. Hi Fred, I seem to remember having a hand in that 🙂 You have a very sharp eye.